Go For Broke or Maybe Gopher Broke. This was a difficult week to get through, mainly because the cold that has been running rampant through the school population finally got me. Even after taking a day off, I haven’t had as much energy. Our neck of the country was also settling in for a cold spell when the boiler gave out in the main building. It made the classrooms quite cold. You just never know what teaching environment you will have in these older buildings. I am looking forward to the three day weekend. The title of my post this week refers to a video I put in the video section. Look for Gopher Broke. I used it this week to talk about prediction, developing conflict and story plot. It is a 4 minute animated video that does not have words and is great for interpreting what will happen next. I stopped it along the way and asked students what clues they noticed and what predictions they could make from them. We also talked about what details in the story made it interesting. I used the video to lead up to my instruction on story telling. I have used a free app called “Toontastic” in the past that the students have really liked. Unfortunately some of my students are obsessed with fighting scenarios and can’t get past these to develop other forms of conflict or plot. They need help in getting their creative juices flowing. I came across Story Sticks on Sarcasm 101. I decided to try something similar and made my own story craft sticks. I color coded for characters, conflict, setting and miscellaneous like she did. However, I printed them out on paper and used a glued stick to glue them on the sticks. I then just color coded the tips and edges with a color crayon. I find writing on craft sticks is a bit difficult and hard to read so I opted for the paper. Click here to see what I wrote on the sticks. 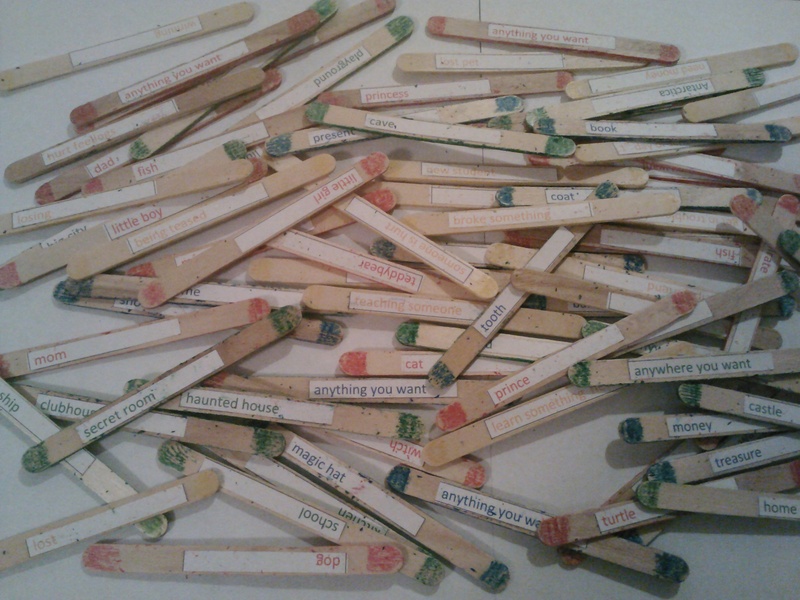 Story Sticks. You may want to make some changes to the list so I kept it in Word format. Uncategorized	plot development, story telling, therapy materials from scratch.